Throw - Boutis There are 17 products. Plaid "Red Scottish" 100% Acrylic, 130x170 cm. Plaid with fringes sides of the width. Plaid with cadrillage of colors: red, white, black and yellow. Boutis/ Bed cover Tenderness floral 100% cotton percale, washable at 60°C, easy iron. Reversible Boutis : 1 side with flowers and 1 side stripes. Colors : delicate powdery pink and green colors. The quilts are in 175x250 cm, 230x250 cm and 260x250 cm. Quilts pillowcases are also available in 32x32 cm and 65x65 cm. Boutis/ Bed cover watercolor flowers 100% cotton percale, washable at 60°C, easy iron. Reversible Boutis : 1 side with flowers and 1 side tiles. Watercolor flowers and tile colors: pink, white and gray. The quilts are in 175x250 cm, 230x250 cm and 260x250 cm. Quilts pillowcases are also available in 32x32 cm and 65x65 cm. Boutis/ Bed cover Toile de Jouy red 100% cotton percale, washable at 60°C, easy iron. Reversible Boutis : 1 side with Toile de Jouy red and 1 side tiles. Colours: red and white. The quilts are in 175x250 cm, 230x250 cm and 260x250 cm. Quilts pillowcases are also available in 32x32 cm and 65x65 cm. 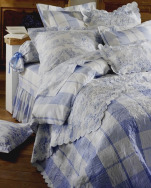 Boutis/ Bed cover Toile de Jouy blue 100% cotton percale, washable at 60°C, easy iron. Reversible Boutis : 1 side with Toile de Jouy blue and 1 side tiles. Colours: blue and white. The quilts are in 175x250 cm, 230x250 cm and 260x250 cm. Quilts pillowcases are also available in 32x42 cm and 65x65 cm. Boutis/ Bed cover bucolic flowers100% cotton percale, washable at 60°C, easy iron. Reversible Boutis : 1 side with flowers and 1 side tiles. 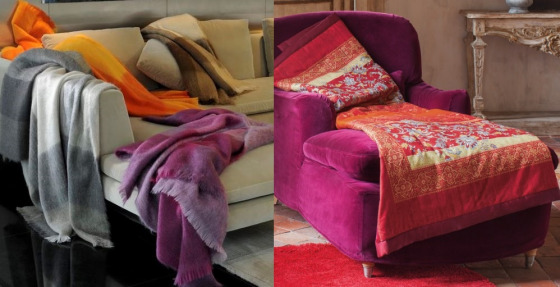 Colors: purple, yellow, green and white. The quilts are in 175x250 cm, 230x250 cm and 260x250 cm. Quilts pillowcases are also available in 32x42 cm and 65x65 cm. 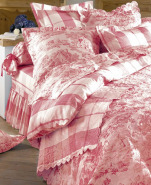 Boutis/ Bed cover ceylan flowers100% cotton percale, washable at 60°C, easy iron. Reversible Boutis : 1 side with flowers and 1 line side. Colors: blue, yellow, green, pink and white. The quilts are in 175x250 cm, 230x250 cm and 260x250 cm. Quilts pillowcases are also available in 32x42 cm and 65x65 cm. Boutis/ Bed cover flowers and butterflies 100% cotton percale, washable at 60°C, easy iron. Reversible Boutis : 1 side with flowers and 1 squared face. Colors: pink, green, yellow and white. The quilts are in 175x250 cm, 230x250 cm and 260x250 cm. Quilts pillowcases are also available in 32x42 cm and 65x65 cm. Boutis/ Bed cover Toile de Jouy grey 100% cotton percale, washable at 60°C, easy iron. Reversible Boutis : 1 side with Toile de Jouy grey and 1 side tiles. Colours: grey and white. The quilts are in 175x250 cm, 230x250 cm and 260x250 cm. Quilts pillowcases are also available in 32x32 cm and 65x65 cm. Boutis/ Bed cover Athena Greek blue 100% cotton percale, washable at 60°C, easy iron. Reversible Boutis : 1 side printed Greek blue drawings and 1 blue solid face. Colours: blue and white. The quilts are in 175x250 cm, 230x250 cm and 260x250 cm. Quilts pillowcases are also available in 32x42 cm and 65x65 cm. 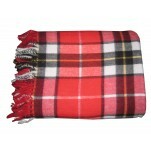 Plaid Grandfoulard Bassetti Bernina V1 135x190 cm, 100% cotton fabric and 100% polyester filling. Presented in box. Plaid easy to maintain.